Bonding is less expensive than other cosmetic treatments and usually can be completed in one visit to our office. 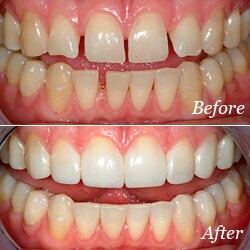 However, bonding can stain and is easier to break than other cosmetic treatments such as porcelain veneers. If it does break or chip, let us know right away. The bonding generally can be easily patched or repaired in one visit.